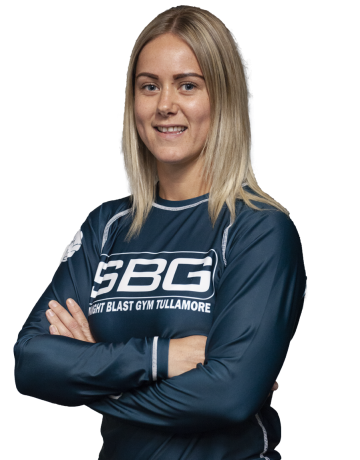 I work and train full time at SBG Tullamore. I love my job looking after new and current members, managing the social media on a daily basis, and I teach the KidFit classes. My favourite part of the job is helping our members with diet and nutrition. I over see the weights and measurement son members, and help them hit their targets through nutrition plans and consistently weighing and measuring them. I am a blue white blue in Brazilian jiu Jitsu, which was awarded to me by Head Coach, Kieran Davern. I took part in the first series of Wimp 2 Warrior Tullamore and had my first cage fight through the programme, which I won. I loved taking part in Wimp 2 Warrior and cannot wait to get into the cage again. In 2018, I have won three gold medals, 1 silver and 1 bronze in Brazilian Jiu Jitsu competitions. I also love to train CrossFit and compete and an intermediate level. I have taken art in three competitions this year so far and got into the final of one of them. I love training CrossFit, it challenges me every day and helps me set new goals. It has helped me get into the best shape I have ever been. I love the community feel within CrossFit, I have found a second family and home at the gym and made lots of new friends. I’ve gained so much confidence which I struggled with for a long time not believing in myself.